After every election, the Rhode Island House and Senate set their rules. Those rules determine everything from when a bill can be introduced, to how a legislator can cast their vote. Over the course of decades in the House of Representatives, those rules have been used to consolidate power in the hands of the Speaker. A group of reform-minded legislators has put forward a proposal to amend the rules that would give power back to the rank-and-file and make the legislative process more transparent. Before those reforms can even be introduced the House leadership is pushing through their version of the rules, without needed changes. At the hearing on Tuesday, January 8th, dozens of Rhode Islanders showed up to demand change. Now a vote is being held on January 10th at 5:00 p.m. in room 101 in the State House. Join us to show your support for change. Common Cause Rhode Island has consistently called for making amendments to bills public prior to votes, especially the House budget. Both Representatives and citizens deserve to know what a committee is voting on. For too many years last-minute amendments have been used to fundamentally change bills, especially in the final days of the session. We don’t feel it is asking too much to let members of the House Committee on Finance read the $9 billion state budget before being asked to vote on it. At the end of the legislative session the House and Senate typically suspend certain rules, including those for public notice, so that they can speed up the legislative process. But when the legislative process speeds up transparency is often run over. Under the current rules, Representatives don’t have to go vote, and go on the record, to suspend the rules. Instead the “unanimous consent” of the majority and minority leaders can suspend the rules without a vote. This change would end that practice and put all 75 members of the House on the record. A discharge petition is used to bring a bill to the floor even if the committee hasn’t voted on it. In 2002 Nick Gorham got 38 signatures on a discharge petition to bring the Separation of Powers amendments to the House floor. Although he wasn’t ultimately successful (at that time it required 40 signatures) it was an effective method for telling then Speaker Harwood that he needed to give Separation of Powers a vote. Several years later the House rules were amended so that discharge petitions could not be walked around the House chamber, like Nick Gorham did, but must sit on the desk in the front of the room, under the watchful eye of the Speaker. There has not been a serious discharge petition effort since 2002. This reform would take the rules back to their previous form, allowing a sponsor to walk a discharge petition around the House floor. Every two years, the Rhode Island House and Senate introduce and pass new rules. Common Cause Rhode Island has long been critical of how the rules, especially in the House, give too much power to one individual, the Speaker. 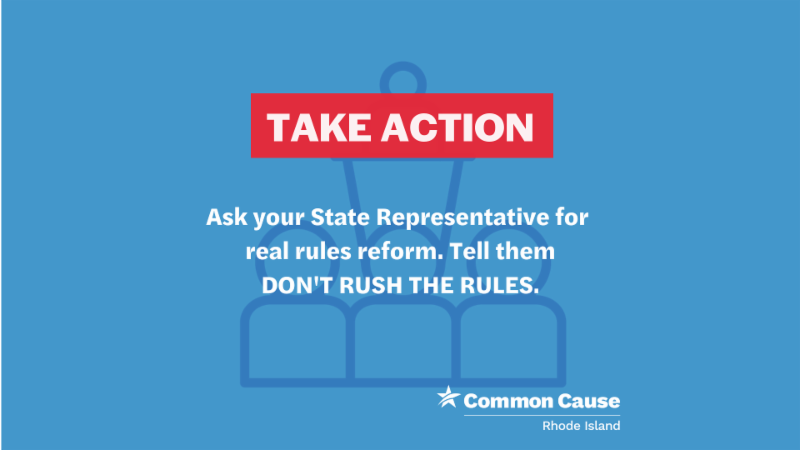 In 2019, we are supporting changes to the House rules that will make the legislative process more transparent and empower rank-and-file legislators. Before the reforms can even be introduced the House leadership is moving to pass their version of the rules, with no improvements to the legislative process, in a hearing held on Tuesday, January 8th. Since 2001, the earliest the House rules have had a hearing was January 27th. What’s the rush? Read more about why we support reforming the rules and why this is an unprecedented move here.